SAN MATEO (December 5, 2012) – Duck Duck Moose, the creators of educationally rich and engaging children’s apps, today announced the launch of its newest title, Duck Duck Moose Reading. The Duck Duck Moose Reading app incorporates the best of Duck Duck Moose’s design, interactivity, and educational content. As the newest characters of the Duck Duck Moose family, Milo the Meerkat and his sidekick Puffs lead children through nine different word and letter activities that teach consonant and vowel sounds to help children begin to learn to read. The new app weaves the Common Core Standards for learning into beautifully designed and interactive scenarios that take place in the zoo and under water. Duck Duck Moose Reading is also the first Duck Duck Moose title to incorporate a new reporting tool built into the app. This new feature allows teachers and parents to monitor a child’s progress through each activity and understand where a child is excelling or having trouble with a letter, word or concept. With Duck Duck Moose Reading, Duck Duck Moose has also included an offline Workbook for the first time that parents can download, print and extend the learning opportunities beyond their mobile devices. As with all their previous apps, the Duck Duck Moose team conducted extensive kid testing throughout the design and development process, including testing in kindergarten classrooms to get student and teacher feedback in a classroom setting. The robust educational content for Kindergarten Reading was created with insight and input from education consultant, Jennifer DiBrienza, who holds a Ph.D. in education from Stanford University and is a former elementary school classroom teacher. Duck Duck Moose Reading is Duck Duck Moose’s 15th title since Caroline Hu Flexer, Michael Flexer and Nicci Gabriel founded the company in 2008 to address the difficulty of finding educational apps for their own children. The Duck Duck Moose collection includes visually stunning and kid-tested apps that teach nursery rhymes and songs, introduce early learning concepts in literacy and math, and encourage open-ended creative play through drawing and storytelling. 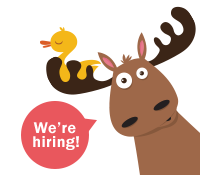 Founded in 2008 by three friends, Caroline Hu Flexer, Nicci Gabriel and Michael Flexer, who share a passion for education, design, music and play, Duck Duck Moose creates some of the most loved educational apps for children. The company has designed and built 15 top-selling apps, from its first musically-focused title, Wheels on the Bus, to its most recent reading app, Kindergarten Reading. The first 14 Duck Duck Moose apps have earned and sustained top rankings in the iTunes and Android stores, and they have received dozens of awards, including Parents’ Choice awards for the first 14 titles, 13 Children’s Technology Review Editor’s Choice Awards, and a KAPi award for the “Best Children’s App” at the 2010 International Consumer Electronics Show.